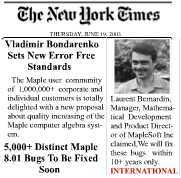 It keeps identifying Maple problems and bottlenecks around the clock, 8766 robot-hours a year. Make a cluster of ten machines, get the problems done tenfold faster. Its sophisticated algorithms afford you the golden opportunity to get focused on the most creative tasks in design because you need not get worried about the bugs identification any longer. © 2002-2008 Cyber Tester Ltd. All rights reserved. All logos and trademarks are property of their respective owners.